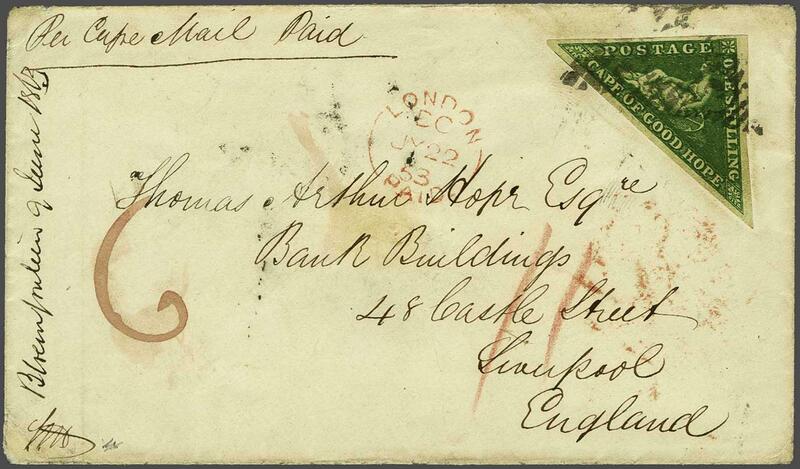 1855/63: 1 s. bright yellow-green on white paper, a used example with good to large margins all round used on 1863 cover to Liverpool endorsed 'Bloemfontein, 9 June 1863' at left and 'Per Cape Mail Paid' at top, tied by CGH obliterator in black. Obverse with manuscript '6' in red denoting the pre-payment from the Orange Free State and 'London / Paid' transit cds (July 22). Manuscript '11' rate credit in red crayon. 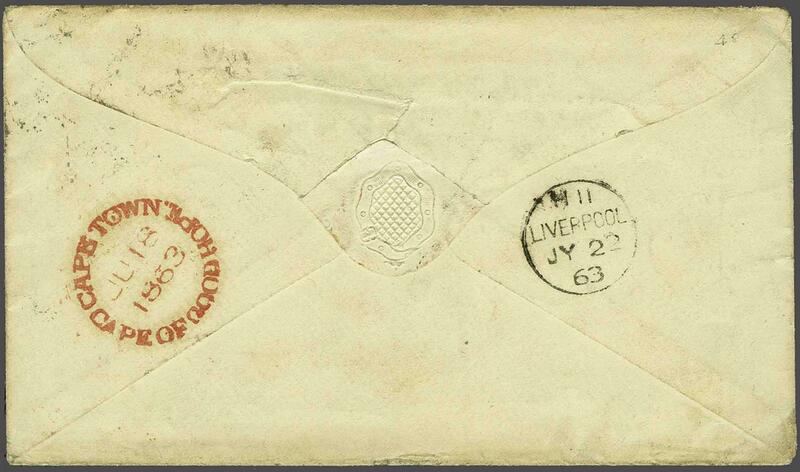 Reverse with CAPE TOWN / CAPE OF GOOD HOPE circular datestamp in red (June 18) and Liverpool cds in black (July 22). A very rare and attractive cover, especially so from the Orange Free State.rnrnProvenance: Collection 'Maximus', Sothebys, Sept 1989, lot 326.rn Collection 'Franschhoek', Spink, June 2012, lot 184.rnrnNote: For similar covers from this correspondence see 'Bonaventure' sale, lot 226 and Maria de la Queillerie sale, lot 179.